In this historical fiction novel, Victorian Edinburgh comes to life with a story that focuses on the evolving (& rather experimental) medical field, more specifically that of midwifery. The Way of All Flesh begins with us meeting Will Raven as he discovers the death of his friend, Evie, a prostitute living in Old Town; the circumstances surrounding Evie's death are suspicious. Will had recently lent money to a desperate Evie, and we soon learn that the money Will gave Evie was not his own, having borrowed himself from a unsavoury lender. Will, a medical student, is set to be on the up in terms of prospects, and by lending to Evie he hoped he was helping her also... However, he may have indirectly contributed to Evie's death. With Evie's death hanging over him, Will is apprenticed to Dr Simpson - a man renowned in the midwifery field. Living under the Simpson roof in New Town (a stones throw away, and yet worlds apart, from the poverty he has previously experienced in Old Town), Will is soon the right hand man of Dr Simpson as he is taken on calls of labour with the doctor, attending to patients at clinic, meeting other medical professionals, and continuing to learn within his profession, including the use of chemicals as anaesthetic agents. Will is one of the main protagonists within this book, however there is another also - Sarah, the Simpson's housemaid. It is interesting to see the Simpson household from her prospective, as well as Will's, but what I particularly enjoyed in Sarah's narrative was her strength, curiosity, and want for equality. Sarah has a great interest in the field of medicine, but as a female & housemaid, she is often reminded about not getting ideas above her station, and yet she constantly shows drive and determination. As the story continues, it becomes clear that there is a doctor in the city undertaking procedures that are dangerous, and illegal, with the lives of many young women being lost... With their own agendas, Will & Sarah soon team up and become a unlikely, and yet dynamic, crime fighting duo. The crime is central to plot of this book, however I would say the focus was more on the medical side. Personally, I had no issue with this, however I just thought it to be something of note. I found the medical information to be fascinating, especially with regards to the innovation of anaesthetic. Given the setting of The Way of All Flesh, it is also worth noting that some of the medical scenes are quite graphic & gory - labours that don't quite go as expected, as well as surgery performed without any anaesthetic. After the opening chapters of this book, I felt that there was a macabre depth to the story that would soon unfold, with that feeling indeed being correct. 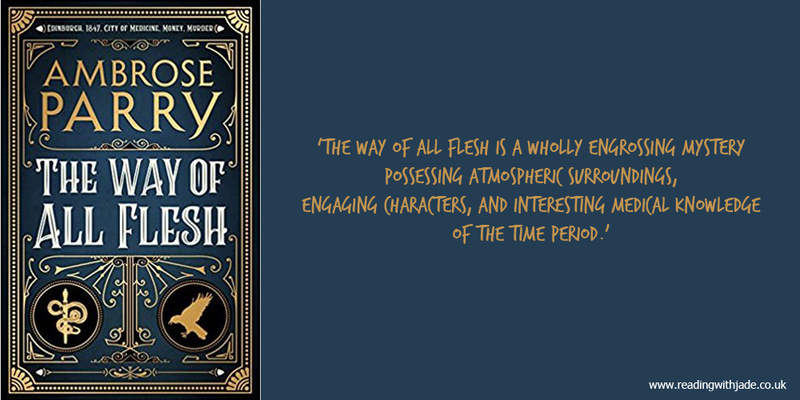 Whilst the plot is unsettling at times, The Way of All Flesh is a wholly engrossing mystery possessing atmospheric surroundings, engaging characters, and interesting medical knowledge of the time period. A remote lodge in update New York is the perfect getaway... Until the bodies start piling up. It's winter in the Catskills and the weather outside is frightful. But Mitchell's Inn is so delightful! The cosy lodge nestled deep in the woods is perfect for a relaxing - maybe even romantic - weekend away. The Inn boasts spacious old rooms with huge wood-burning fireplaces, a well-stocked wine cellar, and opportunities for cross-country skiing, snowshoeing, or just curling up with a book and someone you love. So when the weather takes a turn for the worse, and a blizzard cuts off the electricity - and all contact with the outside world - the guests settle in for the long haul. The power's down but they've got candles, blankets, and wood - an genuine rustic experience! Soon, though, a body turns up - surely an accident. When a second body appears, they start to panic. Then they find a third body. Within the snowed-in paradise, something - or someone - is picking off the guests one by one. They can't leave, and with no cell service, there's no prospect of getting the police in until the weather loosens its icy grip. The weekend getaway has turned deadly. For some couples, it's their first time away. For others, it will be their last. And there is nothing they can do about it but huddle down and hope they survive the storm. An Unwanted Guest is told in chapters, using a diary like method of clocking in, observing what is happening at given times throughout the weekend. Through this storytelling method we're able to get to know all the characters, what led them to this winter weekend away, as well the dynamic they have with their direct fellow guest - for example, we know Henry and Beverley, a middle aged couple, are away on a make or break trip, with their marriage on the rocks and tensions high between the pair. Each set of guests have a unique story of their own, and it is interesting to see how the individuals interact within the group of hotel patrons. A lot of the scenes I felt like I was people watching, and I really liked that. Spanning the course of a weekend, the pacing of the plot within this book was really well done, and I felt invested in the story from pretty early on. I really enjoyed the writing style - a lot of the narrative was quite short & snappy, but yet there still felt like depth to the story and characters. The author wrote in such a way that I found I was frantically page turning at times, and could empathise with the paranoia and uncertainty many of the characters felt. One thing that knocked my personal rating of An Unwanted Guest was the actual murderer reveal, which is a little disappointed in a sense as when reading a mystery thriller everything is leading up to the ending pretty much. Without giving away too, I will say that everything was plonked in front of you at the end, as opposed to having been put together through clues found throughout the book. The ending is two parts almost, the murderer reveal, and more - the more definitely redeemed my disappointment of whodunnit. 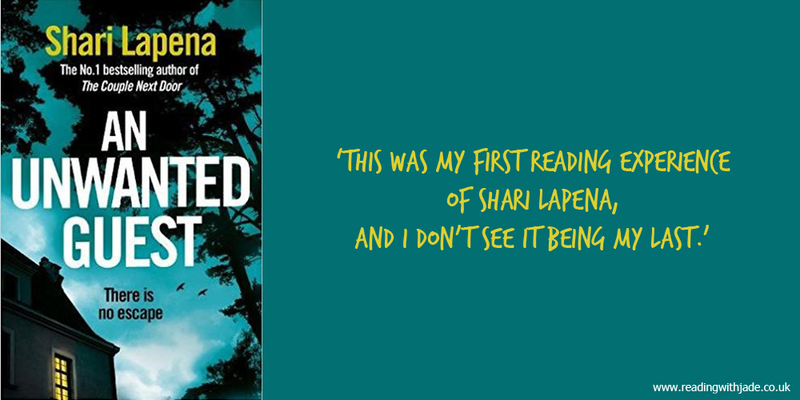 This was my first reading experience of Shari Lapena, and I don't see it being my last. Great reviews, Jade. I am glad you liked An Unwanted Guest and hope you enjoy her other books, which are both good. The Way of All Flesh sounds interesting, too! Thanks, Stephen - I'm keen to check out her other books now. I like Shari Lapena's writing. I've enjoyed all of her books, especially, AN Unwanted Guest. In that case, I look forward to reading her others. I think The Way Of All Flesh is on my TBR list, so I hope I like it as much as you did. I hope so too! It'll be interesting to hear your thoughts, as and when, you do read it.